Mouth Guards: Mouth guards are required for all players at all levels. Skates: Should be sized for the size of a players feet now. Skates must fit with a minimum of room to allow proper power transfer to the blade through the skate. There should be a maximum of ONE finger width at the heel for space. Toes should just about be touching the end of the toe cap on the front of the skate. Socks are optional, and maximum foot to skate contact is achieved sockless. Talcum powder can be used to alleviate blisters on the feet of sockless players. It takes only a couple of skates to build up the callous resistance to skate friction. Laces: Laces should be of proper length as to tie a knot on the front of the tongue. Laces SHOULD NOT wrap around the skate as they offer NO SUPPORT at all. A "double knot" is not neccesary for holding the lace tight. Taping skates: To attain proper support, push the tongue forward and tape across the front of the shin pad and around to the back of the skate(tenor guard) at least three wraps. Shin guards: Proper size is from the folded down tongue to the top of the knee. Shin guards should have enough padding to prevent injury. If padding is needed, the pads are not the right size. Hockey pants: Pants should fit comfortably with suspenders holding them up. Pants should end at the centerline of the knee pad and not go any lower. Shoulder pads: They should fit properly, covering most of the stomach and approaching the top of the hockey pants to cover-up as much as they can of the front of the abdomen. Jock/cup: The best peice of equipment for this protection purpose is the Jock Tech or similar name. It comes with supporter and garter belt attachments for hockey socks. Elbow pads: Should fit comfortably and span the distance between shoulder pad arm pads and gloves. They should allow for free movement of the elbow but enough protection if the players falls and lands on their elbows. Gloves: Should fit with enough room to hold the stick and allow for free movement of the hands. The player should be able to pick up a stick with gloves on if they drop it without removing the gloves. Helmets: Should fit correctly and not shake as they skate. To get used to a cage/shield, the player should watch TV to get used to viewing thru the bars of the cage/shield. Sticks: The height of stick should come up to the bottom of the nose with skates off or up to the chin with skates on. Where can I go to buy hockey equipment? 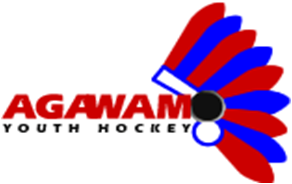 There are several places in the area who specialize in hockey equipment and can provide consultation and guidance.